Stage 4 of the 2014 Bridge Cape Pioneer Trek international stage race was always expected to deliver a shake-up; and it didn’t disappoint. As if the 109km with 2690m of ascent from De Rust to George wasn’t difficult enough, the riders had to conquer some exceptionally rough terrain and contend with rain and cold too. In the men’s race, the Team Bulls pairing of Simon Stiebjahn and Tim Bohme charged to the stage win and in the process reclaimed the overall lead from South Africans Philip Buys and Matthys Beukes (SCOTT Factory Racing). And in the women’s race Asrin Cycling’s Catherine Williamson (GBR) and Alice Pirard (BEL) also grabbed the stage win and race lead. Unfazed by the weather, the German Team Bulls duo were the aggressors on the demanding stage, taking the lead on a climb at 68km into the race, intent on reclaiming some of the three minute deficit from Stage 2 when they relinquished the race lead to Beukes and Buys. Beukes managed to stay with the Bulls riders over the top of the climb, but Buys was a little further back, expecting to rejoin on the descent when Beukes sustained a cut to his rear tyre. Bohme and Stiebjahn clocked a time of 4 hours 59 minutes and 24 seconds. Second place on Thursday went to the Asrin cycling duo of James Reid (RSA) and Herman Persteiner (AUT), just less than two minutes back with Buys and Beukes rounding out the podium in 5:06:24, putting them 3:35 off The Bulls’ overall lead. While it was day of misfortune for Buys and Beukes, it was a day of improved fortune for Reid and Persteiner, who suffered a mechanical on Wednesday and were given a time penalty on Tuesday for being more than two minutes apart at the stage finish. They moved from ninth up to fifth the General Classification with two stages remaining. “We’re so eager to get a stage win and came close today. But I guess the Bulls were more motivated with the GC lead as their target. We’ll keep trying,” quipped Reid. In the women’s race, Williamson and Pirard had passed De Groot and Stenerhag on one of the early climbs and were unaware of the mechanical trouble suffered by the race leaders, forging ahead steadily and eventually finishing 19th overall in a time of 6:04:02. “I’ve been riding one speed this whole race so we were behind Robyn and Jennie early on but caught their group after a while. Then on one of the steep climbs we moved ahead of them. We seem to be better on the steep climbs than they are,” recalled Williamson. “I don’t know what trouble they had but I know that we rode cautiously but steadily today because we didn’t want to risk crashing or puncturing. Alice is a really good descender, so I followed her lines on the downhills and we actually finished really strong. It’s great to be leading the race, but we can’t be satisfied until the end of the final stage and will do our best to defend the Pink Jersey,” she added. De Groot suffered a sidewall cut in her rear tyre, but she and Stenerhag had an additional problem with the rear wheel axle. “The quick release through-axle broke while we were trying to remove the wheel. So we had to repair that first. Then the tyre cut was too big to plug, so we had to insert a gaitor and a tube. 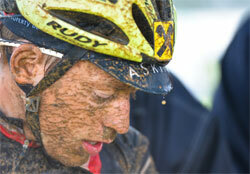 When it’s muddy all of this is even more tricky to do,” said a dejected De Groot. Second place on the stage went to Cherise Stander (RSA) and Candice Neethling (#iride4Burry) with Meerendal Wheeler’s Theresa Ralph (RSA) and Esther Suss (SUI) claiming third place. De Groot and Stenerhag were fourth, but lost 37 minutes and the overall lead to Williamson and Pirard, who now have a healthy 24:21 lead. In the other team racing categories, South Africans Brian Lennox and Hannes Hanekom (Klein Karoo Giants) were the top Amateurs, extending their GC lead in the process. South Africans Kobus and Fienie Barnard (Klein Karoo Mixed), won the stage again, reducing their deficit by a further three-minutes to Germans Max Friedrich and Jana Mischance (Firebike Tomotion by Blacktusk), who were second on the stage, but retain the Mixed overall lead. Heinz Zorweg (AUT) and Bartie Bucher (SUI) of Team Meerendal Wheeler 2 claimed a fifth consecutive stage win and now hold a massive Masters category lead; while South Africans Johan Labuschagne and Gerrie Beukes (Klein Karoo Veterans) secured a third successive stage win and moved into the Veteran category lead. In the Solo men’s division, Travis Walker (RSA - Kargo Pro Racing) won the stage in his category and extended his General Classification lead, while Christine Janse van Rensburg (RSA), extended her Solo women’s category lead with another stage win. Friday’s Stage 5 from George to Herold is somewhat deceptive. In just 71km, riders will have to climb 1755 metres, initially up an 18km climb out of George to the Montagu Pass, after which riders will be taken on a new section of trails through the Klein Langkloof along the northern slopes of the Outeniqua Mountains. For more information on the Bridge Cape Pioneer Trek, visit www.capepioneer.co.za. For race updates, follow @BridgeCPT on twitter and Bridge Cape Pioneer Trek on Facebook. Ostrich feathers were once worth their weight in gold.